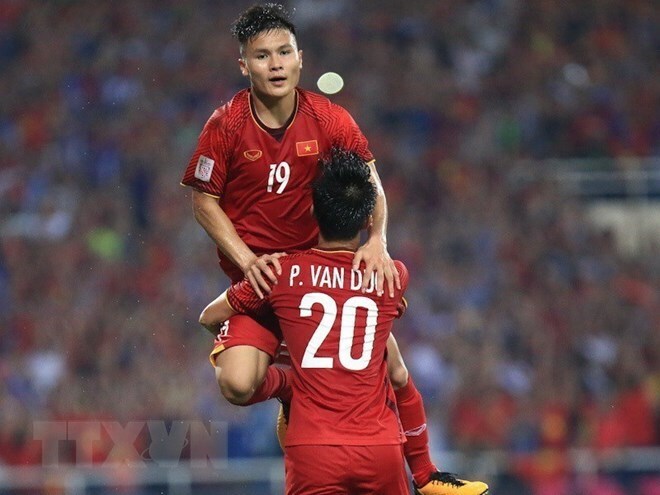 Vietnam entered the finals of the ASEAN Federation Football (AFF) Suzuki Cup 2018 after defeating the Philippines 2-1 in the return leg of the semifinal, which took place at Hanoi’s My Dinh Stadium on December 6. The squad beat the Philippines 2-1 in the first leg held in Bacolod city of the Philippines four days ago. The teams battled a stalemate in the first half of the second leg, as various chances were missed. A free kick was awarded for Vietnam four minutes after the whistle, but Luong Xuan Truong (Number 6) could not take the ball through the fence. Nguyen Quang Hai (Number 19) bagged two chances to score at the 17th and 28th minute, but he did not succeed. Two minutes were added to the first half then it ended goalless. Vietnam made the first substitution as Nguyen Huy Hung (Number 29) replaced Xuan Truong at the 60th minute. Quang Hai’s free kick six minutes later went straight into the hands of the Philippines’ keeper. Nguyen Tien Linh (Number 22) came on to the game on the 74th minute, while Nguyen Anh Duc (Number 11) was subbed out. Quang Hai broke the deadlock at the 83rd minute with a tap-in from a left-wing pass of Phan Van Duc (Number 20), bringing joy to the sea of home fans. Coming from the bench, Nguyen Cong Phuong (Number 14) weaved through the Philippines’ defence and blasted the ball towards the roof just four minutes later, extending the 2-0 lead. At the 89th minute, James Younghusband scored to shorten the gap for the Philippine side. With this result, Vietnam entered the finals with aggregate score of 4-2. Malaysia become the first finalists of the 2018 AFF Suzuki Cup after a 2-2 nail-biting draw with the defending champion Thailand in the second leg of the semi-final in Bangkok on December 5. The final first leg between Vietnam and Malaysia is scheduled to take place on December 11, and the return leg will be held four days later. The AFF Suzuki Cup 2018 is taking place from November 8 to December 15 with 26 matches among 10 teams. Vietnam’s national men’s football team is in Group A together with fellow Southeast Asian teams, Malaysia, Myanmar, Cambodia and Laos. In the tournament’s history, Vietnam won the championship just once in 2008. With the leadership of Korean head coach Park Hang-seo and the current squad, both Vietnamese and Korean football fans are hopeful that the S-shaped country’s team will take the trophy for the second time after 10 years awaiting.